Very few investors knew much about mini-cap stocks. There was a lot of educating that had to be done. First, CDMG suggested a name change from PRO TRADER to MAEDEL’S MINI-CAP ANALYST. This focused on both the expert (Neil Maedel) and subject matter. Second, CDMG created an intriguing air mail-themed envelope from Switzerland. This helped catch the attention of prospects and really set this piece apart. An information-packed 16-page letter created in the form of a “Stock Profit Alert” told the exciting story of mini-cap stocks. Prospects gained valuable knowledge just by reading this alert. 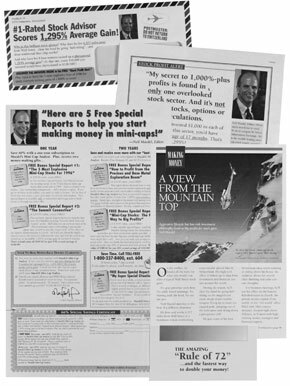 The key “hook” was a Free Special Report, “The 5 Most Explosive Mini-Cap Stocks for 1996” Each of these stocks were teased to in the main letter. The copy was filled with many exciting profit examples, benefits and big promises to the reader. Finally, a special offer was made including savings of up to 66% and up to five FREE Special Reports. At a time when little-known stock newsletter promotions have failed left and right, this promotion has pulled outstanding response. Client Bernie Hertel, President of The ProTrader Corp., says: “Thank you for your exceptional effort…After only the first mailing, we have already increased our subscriber base by almost 50%. The response is tremendous. Your creative concepts and various strategic recommendations were invaluable to us…All aspects of the project were professionally handled and we did not have to worry about a thing. If your product or service isn’t generating the kind of enthusiastic response that MAEDEL’S MINICAP ANALYST is enjoying, the solution to your problem might be as simple as a phone call to CDMG.